The doozy of a 96,000 km service would have come up for the gas cars during this period. The maintenance totals for the gassers now stands at $3,000, and that is only for regularly scheduled maintenance!! The Leaf has now cost me $120 in scheduled maintenance. Zero unscheduled maintenance so far. 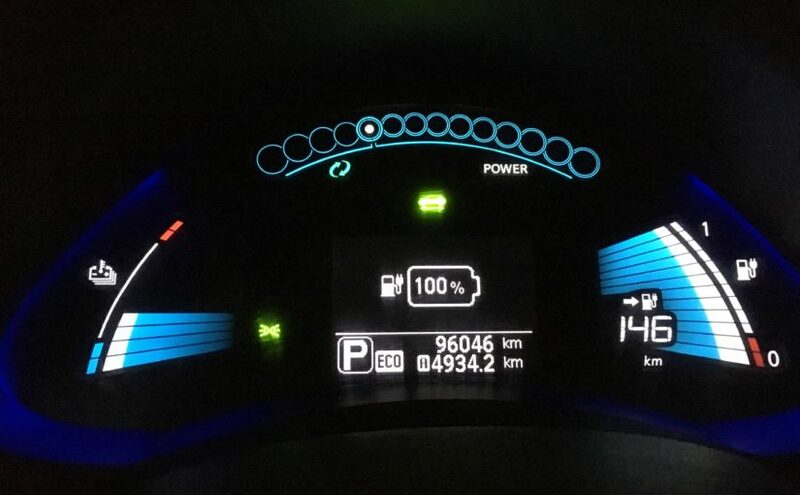 The car has been very reliable for me, and this is born out in the experiences of many others over the 5 year life of this vehicle (see http://www.energytrendsinsider.com/2015/04/13/nissan-leaf-drive-train-is-25-times-more-reliable-than-conventional-cars/ and http://www.truedelta.com/Nissan-LEAF/reliability-968). 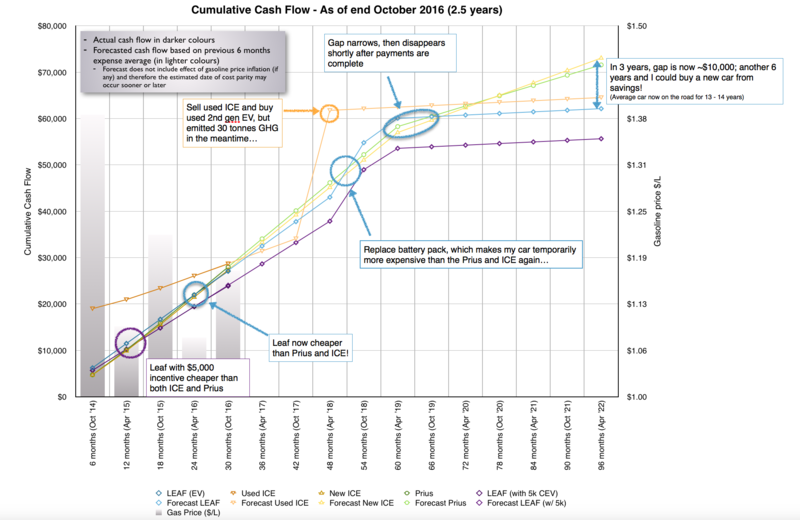 If you are still on the fence about whether to own a used Leaf as your second vehicle send me a note. 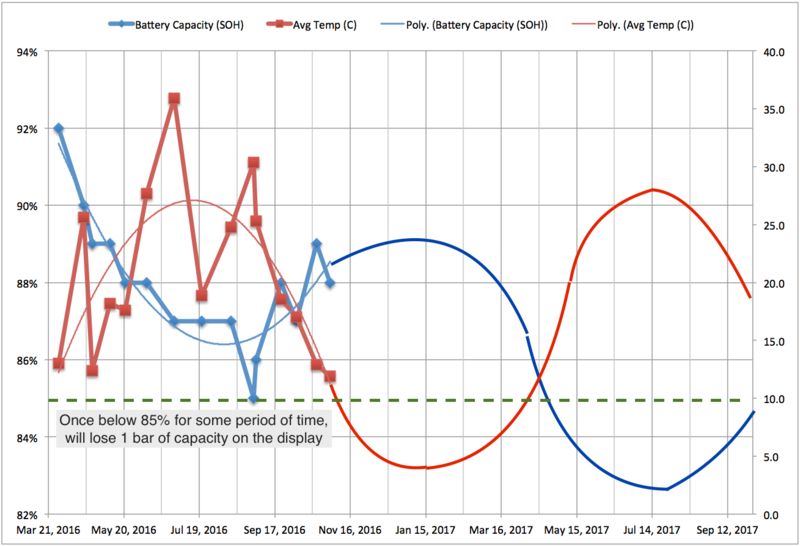 In my last cost update, I relayed how I had started checking my battery capacity with a phone app and an OBDII interface. 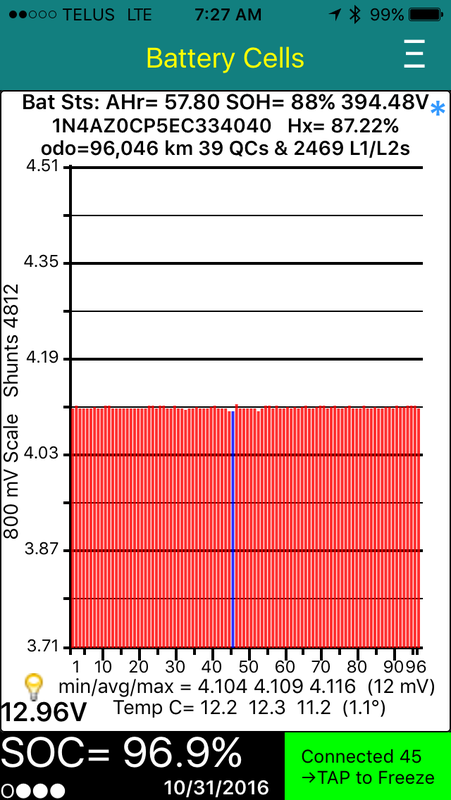 I’ve continued to collect data over the intervening year, and I’ve since moved my expected battery refit back a year. Really though, that would likely be based out of ease of convenience, I’ll still be able to get to work with a battery at 75% capacity, which I likely won’t see until after owning the car for several years. By that time we’ll have replaced the Forester with a long-range EV (like a Tesla Model Y), and the Leaf will only have town duty. I doubt we’ll ever replace the battery on it. 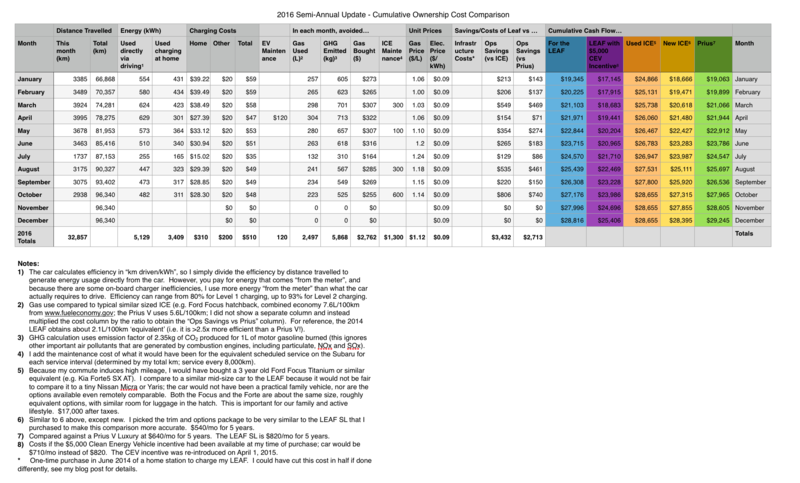 So despite the high upfront cost and the total lack of incentives when I purchased the vehicle, I still expect it to save a significant amount of money over the life of the vehicle. Sometime in late spring 2017 I’ll probably say goodbye to my first battery capacity bar (once I drop below 85% permanently). 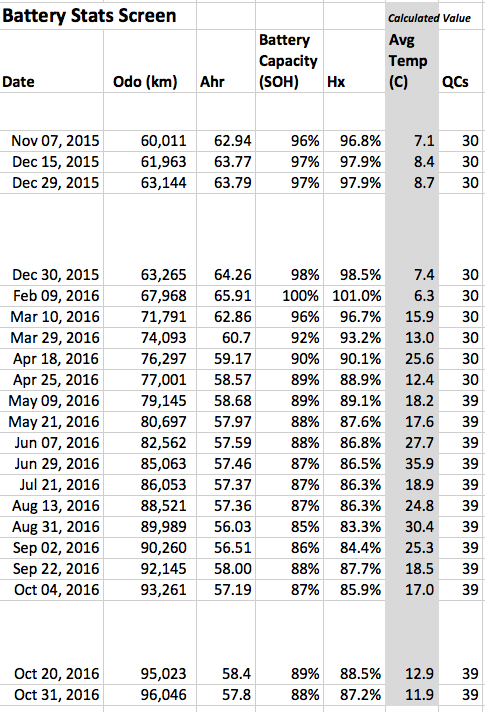 The next one disappears at 78.75% capacity, and every 6.25% after that (for reasons unknown, Nissan chose a wonky capacity scale… actually marketing probably had something to do with that!) My recollection of the owner’s manual was to expect the average car to have 80% capacity after 5 years and about 70% after 10 years. My electric rate is 2x yours, so not so much savings. I don’t save much on maintenance either as I do it all myself. I buy cars on Craig’s List or auction and can save a bunch on capital costs as well. I do think they will start to road tax the BEV soon and that will hurt the cost justification. Same with losing the rebates, tax breaks, and subsidies. However, I’m watching and hoping the cost will drop. I do think the hybrid powered on high blend ethanol will do more for lowering emission. Just to much dirty grid power on the planet. I’m at retirement age, so it may come that my future car purchase is no car. Rely on Uber personal transport. Next Next post: 2017 starts with a bang!